Our 18:1 AWF Pro Sausage Caulk Gun is a manual caulking gun that takes both 20.2 oz Sausage Foil Packs and industry standard 10.3 oz. Cartridges. Its durable design is perfect for frequent high volume use and features an easy to clean aluminum barrel and replaceable plastic tips. The 18:1 mechanical advantage provides 18 lbs. of application pressure for each lb. of force applied to the trigger handle, perfect for applying high viscosity caulks and adhesives. 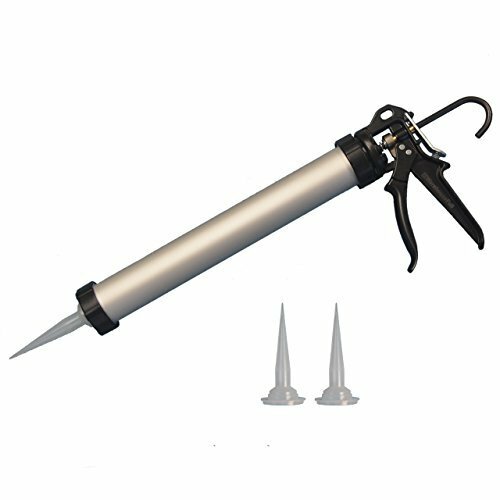 In addition, our caulking gun features an instant pressure release tab, to prevent excess caulk leakage and a pressure plate that converts from sausage packs to 10 oz cartridges in seconds. If you have any questions about this product by AWF-Pro, contact us by completing and submitting the form below. If you are looking for a specif part number, please include it with your message.